Your "what" is obvious. Most companies are wising up to their "why." Our focus is the "how" of it all. The living embodiment of the work you've done to become aware of what needs to exist is the most important piece of the puzzle. Plenty of organizations have a purpose, vision, and values but the link between values and behavior is often broken, or missing altogether. Organizations could accomplish so much more if they tapped into the passion evoked when we connect to others, purpose to purpose. Individual and organizational purpose go hand in hand. When we guide ourselves back to a daily standard of feeling great while doing our jobs, that's where our clarity is, that's where our joy is, that's where our flexibility is, that's where our balance is, that's where our good ideas come from. If we can be in the world fully, what are we capable of? There are 6 main stages of helping an organization evolve to meet its potential and serve its people effectively. Reinvent the game while you're playing it. The soul of a company is determined by its leadership. All too often a leader has wonderful intentions, but gets bogged down in the minutia of running an organization that he or she falls out of alignment with the ideal version of themselves. Leadership teams sometimes fail to understand the net impact their way of being day to day has on their company and their employees. International Personnel Management Association showed that when consulting is combined with coaching, individuals increase their effectiveness by an average of 86% compared to 22% without coaching. The CEO’s perspective needs to be evolved enough to encompass not only their higher purpose, but also that of their company. How will you lead? How will you serve? What will be your legacy? This stage is designed to change behaviors through deep self-awareness and shifts in beliefs of self. Explore and set goals with soul. Reveal personal and interpersonal blind spots. Make empowered choices. Less proving, more living. Step further into radical authenticity and inspire employees along the way. Identify limiting beliefs. Accentuate your superpowers and make a meaningful impact on your world. Gallup did a global study in 2013 which revealed some impressive stats around employee engagement. In the US, 70% of employees are disengaged, costing organizations $450-$550 billion annually. Employee engagement is huge, and teamwork and effective collaboration are pillars within the commercial landscape today. So why do so many people within organizations report feeling under utilized, under appreciated, and disengaged? Paying attention to the details in how teams are aligned with each other, with the company’s purpose, and the story behind it all is absolutely key. It’s easy to justify foregoing time spent on clarifying team alignment in favor of clarifying profit goals, but these are interconnected. The better the team alignment, the more potential a company has for momentous growth. In an age where we all crave real connection, the best way a company can inspire the employees is to cater to this basic desire in inventive and meaningful ways. When we take the time to ground our work into the deep connections that engage us, we are overwhelmed by the energy and contributions so willingly given. More and more we are understanding the importance of values and vision established by a company. This is where we are going - our societal norms are evolving. But, in most companies the effort unfortunately stops with the clarification and establishment of the values and vision. They end up in a list on the website, and maybe hung up on a wall somewhere in the office. But, there is no real connection to those values that inform daily attitudes and approaches to business. What is the company doing to honor and integrate those values into the day to day operations? Are their employees even able to talk about the values and how they see them manifest within the company operations? In order for the company to have the impact they envision when they decide to establish their mission and values, integrating them into their work flow is essential. Efficient transactions and standard operating procedures are necessary, but they need to honor the soul of the company in a multi-faceted way in order to lift the company to the next level. Be intentional about the heartbeat of your company. The heartbeat of your company is in the every day processes. How often do we think about organizational identity as it relates to process? Part of mobilizing an organization to live its values is redefining the way the processes feel. This aspect of the strategy covers everything from recruiting, interviewing, and onboarding practices to meeting design, quarterly reviews, and accountability partnerships. The degree to which a company showcases conscious business is apparent from the second a prospective team member reviews a job description and it continues to show up through meeting rhythms, progress reports, and individual growth opportunities. The way a company runs minute to minute ends up dictating how employees feel minute to minute. Knowing this, companies can drastically affect the collaborative goals, the productivity goals, and the communication goals by paying attention to these details. The goal is for every person within an organization to be invited to be 100% human, 100% of the time. People want their lives to mean something. Organizations are for the people, by the people, made up of the people. So, let’s remember how to be people. Let's serve the essence of the human experience. What if the culture of your workplace served as an invitation for everyone to step into their power and their authenticity? What if by simply going about the day to day tasks and activities, people could feel a steady dose of deep personal fulfillment, no matter what the actual “job description” says? This is possible through conscious culture development. Shared purpose is a central driver to being resilient as an organization. An examination of how it feels to work within an organization is necessary to begin this transformational work. Is your mission compelling enough to inspire the dedication it takes to make your company valuable in the long term? Storytelling within an organization is absolutely essential, both internally and externally. 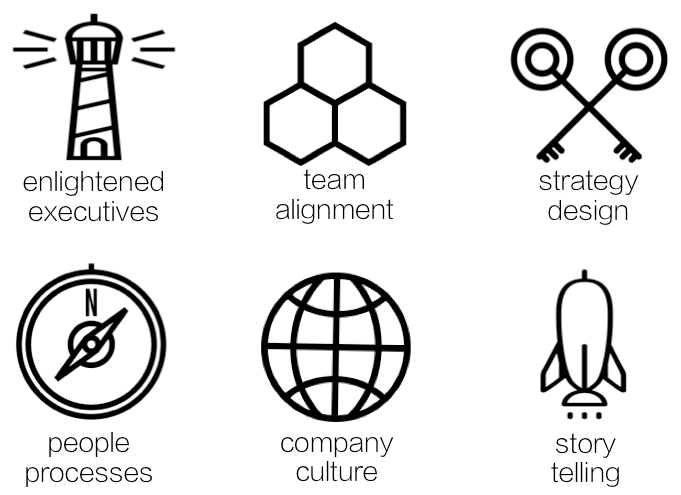 Organizational stories have many dimensions, each of which illuminate some aspect of who the company is. History, values, actions, core beliefs, competencies, principles, purpose, and mission are examples of these aspects. Neuroscience has proven that humans connect on multiple levels to stories, creating lasting impact on cognition. Humans do not connect as well to unilateral dry facts or statements. The Journal of Biomedical Informatics published a study in 2014 that confirmed that decisions are made primarily through emotions, not logic. Therefore, a narrative that appeals to our emotions and our social nature will allow people to connect more deeply and meaningfully to a product, service, company, or philosophy. This applies to external marketing and PR communications as well as internal company cultural communications. Because of the neurobiology of how our brains respond to an engaging story, there is a better chance for true understanding of the information and the intention of the storyteller. The goal with storytelling is to capture the hearts of every stakeholder that touches an organization. What are you trying to be? What's possible now? How can the world be different because of your company? Why has this group of people come together in this moment? Is there a profound truth to be explored? Hopefully there is. Wow, You read all that? let's chat.